Troubled electronics retailer Best Buy said Thursday that it has teamed up with Samsung to create boutique shops in more than 1,400 U.S. stores. Best Buy founder Richard Schulze, who owns 20% of the retailer's shares, had been trying to buy the company for months. But a March 1 deadline came and went without a final offer. 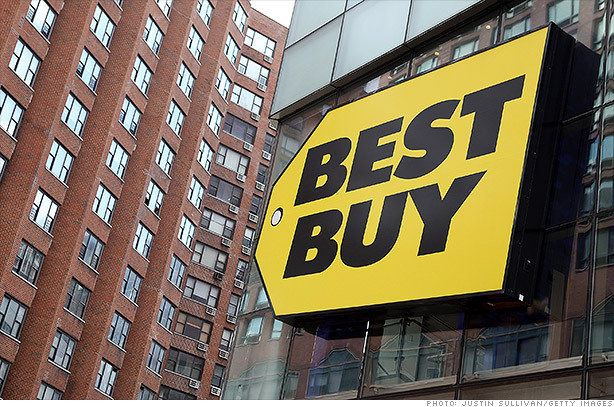 Best Buy CEO Hubert Joly has been cutting staff and closing stores to try to right the ship. He also introduced a price matching guarantee designed to combat the loss of sales to online rivals such as Amazon (AMZN). Joly's turnaround efforts seem to be paying off -- Best Buy reported better-than-expected sales and operating profit in the latest quarter. Even Schulze seems to be buying in. Late last month he returned to Best Buy as chairman emeritus -- a move widely seen as an endorsement of Joly's efforts. The deal with Samsung is yet another step forward. By May, 900 Best Buy and Best Buy Mobile specialty stores will house Samsung Experience shops, designed to showcase Samsung's full range of mobile products in one location. Investors seemed to like the idea. Shares of Best Buy (BBY) surged more than 13% to a new 52-week high Thursday. StockTwits traders also had plenty to say. As long as it's done in a measured way, I'd have to agree. In the back of my mind, I can't help thinking about another retailer using a so-called store within a store concept. J.C. Penney (JCP) anyone? It's true that J.C. Penney is still struggling to get the concept to stick, but Best Buy is a different animal so I'm certainly not going to rush to diss it. At least not yet. And judging by the stock reaction, investors seem to think it's a move in the right direction. Hmm. Interesting concept but I'm not sure Samsung is quite ready to make that leap. But it may give them yet another avenue to showcase their much anticipated Galaxy S4, which will go for $250 a pop. It's not yet clear when the phone will hit store shelves, but pre-orders will begin April 16.